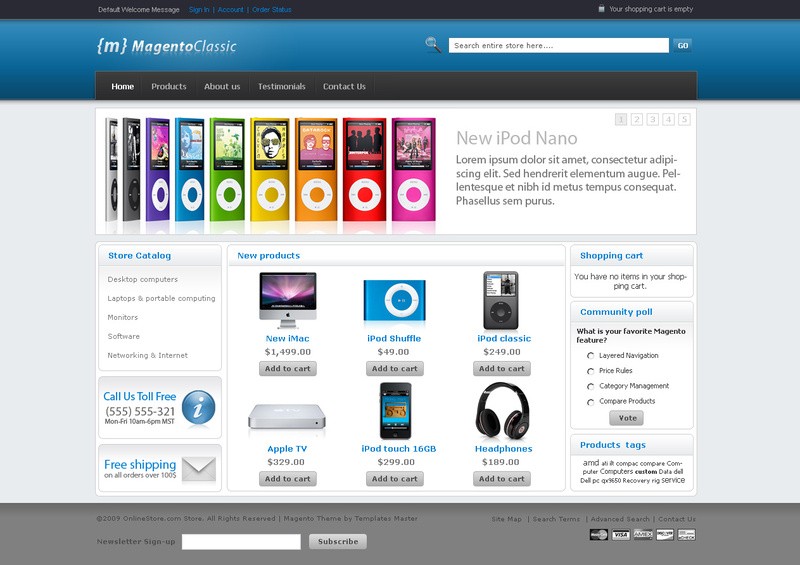 Free Magento Classic Theme is now available for download! This entry was posted on February 17, 2009 by TemplatesMaster. We are proud to introduce first free professional Magento theme. Feel free to download it from our Magento templates store or Magento Connect. Check theme demo of our free magento theme at our demo server. 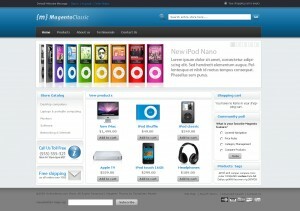 Magento classic theme is available in 10 colors now. 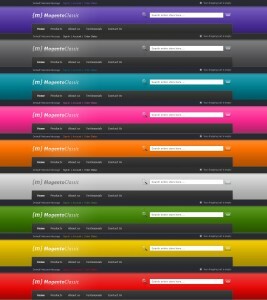 Additional colors can be also downloaded at our server. Installation instruction and source .psd file is included in this package. Template is available under Creative Commons License for commercial and personal use. We received dozen of emails asking for commercial license. Frankly speaking we were not planning to offer this template under commercial license but for all who want to buy it please go to Magento Classic Commercial License. More free and paid Magento themes are available at https://templates-master.com/magento-templates.html. We have also great offer of free Magento extensions. I like your magento classic theme. Great work. WOW I must say this is Fantastic work. I have it installed but not yet configured but will certainly be putting it up and online soon. I will definitely need a color change (Grass Green) to match my website products as we deal with Outside Decoratives. As everyone else stated Thanks for this great Theme and Thanks for making it Free. Some people cannot afford some of the finer themes as they are just starting out like we are, but this makes it even that much better. I would like to see a Donations link to at least be able to donate something for your HARD WORK and looking out for the ones who cannot afford the higher end themes. Thanks Ron. We really appreciate your kind words about our product. This theme is completely free to use and our main idea was to help magneto users to make their stores looks different from default magento for free. We understand that many small store owners can't afford paying for commercial themes from start. Also we are planning to deliver this theme in 9 colors this week. Our psd is also easy to edit so almost everyone can change color of template in few minutes. Ron, thank you very much for your kind word. We are really glad to help people all around the world with this theme and we really don't want to make money from it. So the best thing you can do is to spread good word about our work. I just installed your template but the slider isn't showing. How do I get it to display? Thanks! I just installed your template but the slider isn’t showing. How do I get it to display? Thanks! Have you set 3 column layout for home page? I have showcase enabled and layout set to 3 columns and I am still missing the slide bar. Everything else looks great. Any suggestions would be greatly appreciated! Hello Ben, please provide link to your store. I cannot get the slider to show images, either. OMG! It was the Fontis editor that was changing the code and preventing the slider from working--as well as the payments gif from showing up. May I suggest that disabling the Fontis editor should be added to the instruction document? Great template, in any case. I have had the same issue of the wysiwig editor rewriting the slider static code block. Any tips on turning the default editor off while I add the code block ? OK, not sure why this took me so long to find but the default WYSIWYG editor was causing the same problem in version 1.4.0.1 as Fontis was. works great now - many thanks. Gerard, Please check static block 'showcase'. It should be enabled in admin. How do you add items to the navigation bar? Please check 'menu' staic block. Categories tree is created by magento. I dont seem to get the navigation bar to add navigation. What do you mean by menu in static blocks? What program do you recommend for editing the .PSD files? Any tips/tricks in doing so? If you don't have photoshop you can try using gimp. It's free to use and should understant psd format. Hey, wicked template.... but doesn't seem to quite work for me. Installed as per instructions but the products are not showing up in the center column. Please set products as new in magento admin. Hey, wicked template…. but doesn’t seem to quite work for me. Installed as per instructions but the products are not showing up in the center column. Geoff, you should set products as new in admin to show them on main column. Hi templatemaster, thanks for the great template, will be cutsomising it alot in the next few days! just a quick question, but it all displays okay, until i click off the home page.. then strangly the top banner dissalignes etc. What problem do you have? Great template, up and running with no problems, only one problem. This template top menu was modified so no it can have unlimited number of top categories. You should edit /app/design/frontend/default/f002/templates/catalog/navigation/top.phtml to set it back to default view. i have same issue that top menu don't show new categories at all, only home and product, how i add category there?? you say: make default" how? what and where to write? and please one more: how i change theme color? ?